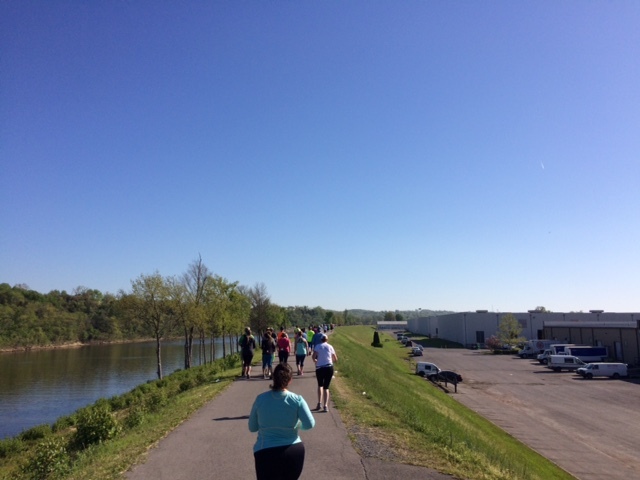 Today was the Purity Moosic City Dairy Dash 15K, 10K, and 5K. I ran the 10k, as did my daughter, and my husband chose the 5K. It was a beautiful day, not a cloud in the sky. At 6:00 AM, when we left the house, it was chilly, but the day warmed up to the point that I actually was a little warm in my long-sleeved shirt. I chose to overdress because the past couple of times that I have run this race, there was quite a bit of wind on the back stretch which runs along the greenway by the river. This time, however, just a nice cool spring breeze. I didn’t train as well as I should have for this race, so the final couple of miles were tough, but overall I am pleased with my performance. I was well within the 1 1/2 hour time limit, and had just enough left in my legs to kick up the pace as I approached the finish line. This is one of my favorite races here in Nashville. I love the pancake flat course, the ice cold chocolate milk at the finish line, and the fabulous long-sleeved tech shirts. And this year, they added finishers medals, and macaroni and cheese at the awards area. 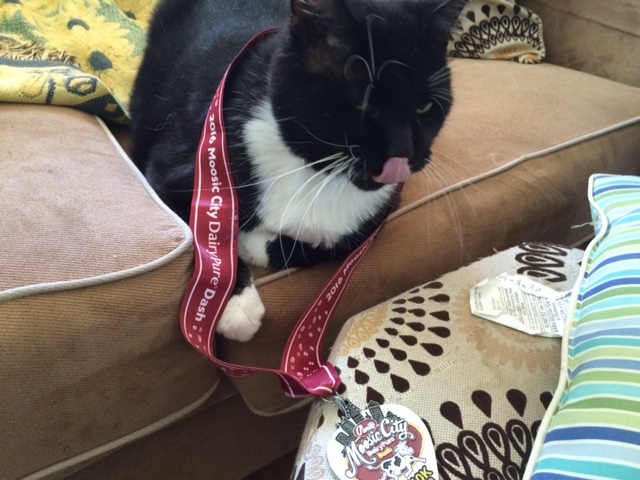 Here is Simon, posing with my medal and race bib. 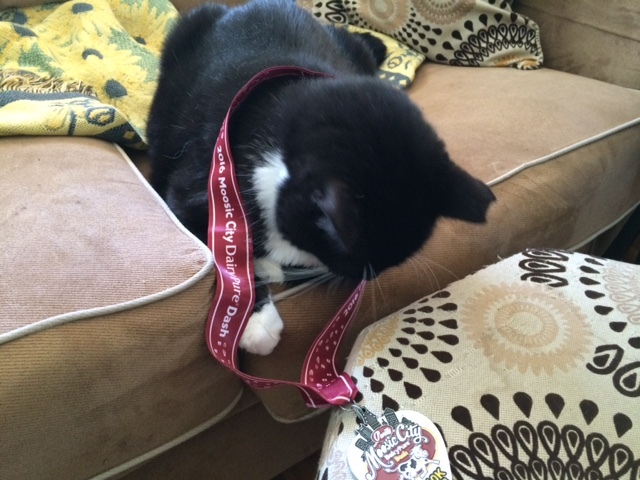 Here he is wearing my medal, and wondering how he could have won when he doesn’t even remember running. Notice that his tongue is out because he decided to chew on the ribbon! 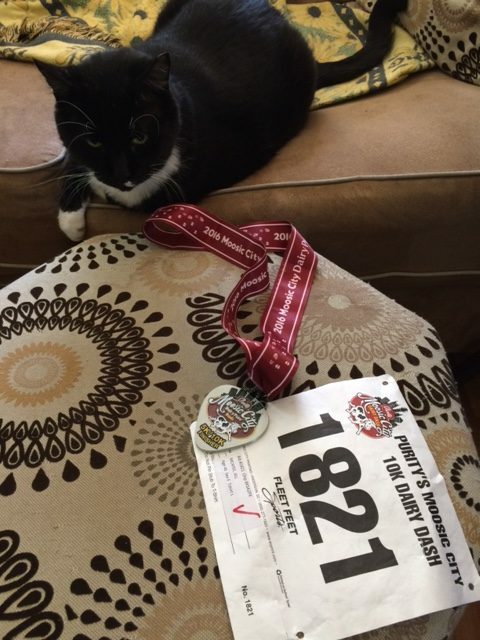 I can’t scold him – I am the crazy one who put my race medal on my cat. I would also like to congratulate my daughter, not only on finishing her first 10K, but on placing 4th in her age group. She was 12 seconds shy of making it onto the podium! She has already decided that next year she will be in it to win it!